Low-carb Cauliflower crust rainbow pizza is packed with veggies inside and out, and is perfect for kids and adults. Rainbows are happening in the kitchen today! We’ve transformed the best cauliflower crust pizza into a rainbow cauliflower crust pizza. The rainbow veggies are so delicious and even more pleasing to the eye. My daughters fell in love with this pizza and could not eat enough of it! 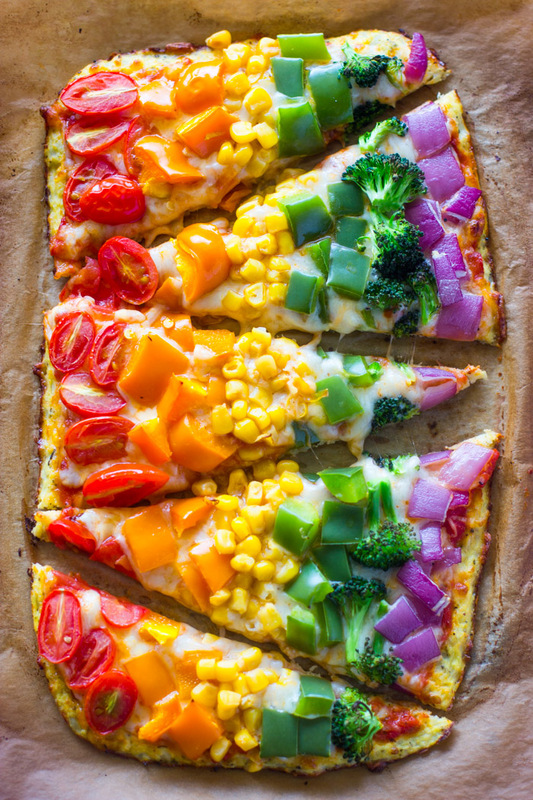 But why make cauliflower crust rainbow pizza? Because cauliflower crust pizza is tasty! Top this delicious pizza with any type of veggies you have. Use whatever is in season or your favorite pizza toppings. Just be sure to dice the veggies really small and arrange the veggies from light to dark to create a rainbow look. Begin by make the crust. Cauliflower pizza crust is much faster to make than regular pizza crust because no rising needed. Allow the minced and steamed cauliflower to cool before extracting the water. Using a soft kitchen towel to extract the water will give you the best results. Make sure to get all the water out of it, like every last bit! I squeezed my water how so hard I ended up with an amazing ball of cauliflower. remember, the trick to making a perfect cauliflower crust is to squeeze out as much liquid as possible out of the cauliflower. Be sure to check out the full post here for more a more detailed explanation and step-by-step photos. What you are seeing above is the cauliflower ball after I have processed it in the food processor, then steam it in the microwave, and drained all the water out of it. 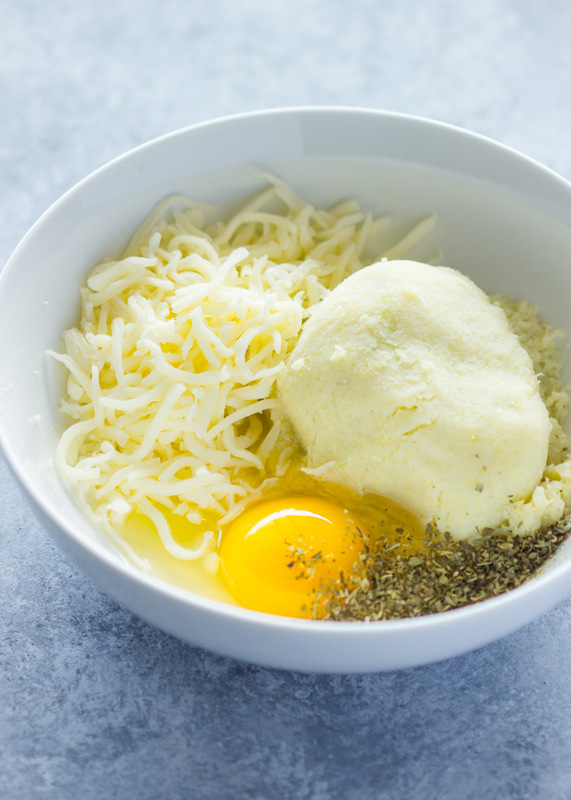 After you have done so, place the cauliflower ball in a bowl and add an egg, 1/4 cup Parmesan cheese, 1/4 mozzarella cheese (you can also omit the parmesan and use 1/2 cup mozzarella instead), salt, garlic powder (optional) rosemary and oregano. 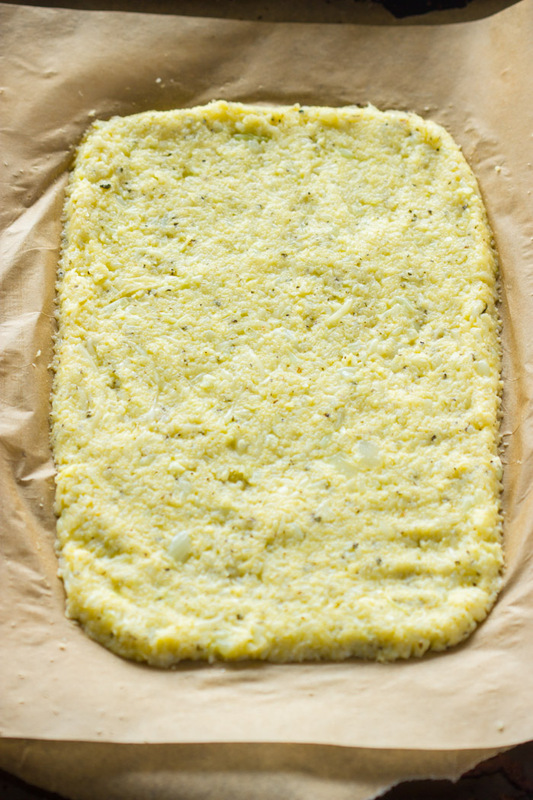 Mix it all in with a wooden spatula or your hands until a dough forms. Next, spread the dough out on a lightly greased parchment paper or a pizza pan like you would with regular pizza dough and bake for 12-15 minutes or until the crust begins to brown on the edges. This is probably a good to dice up the veggies. Remove from oven and add the pizza sauce, cheese, and diced veggies. Be sure to arrange the veggies in a rainbow pattern! Bake for another 15 minutes or until the cheese is fully melted and the edges are browned. Slice the pizza, serve hot. The pizza will last in the fridge for up to 3 days. Re-heat in microwave or toaster oven. Enjoy! Remove the stems from the cauliflower and cut into chunks, Place the cauliflower into a food processor and pulse it until it resembles the texture of rice. If you don't have a food processor, you can use a cheese grater or chop it very finely. Microwave the processed cauliflower uncovered in a microwave safe bowl for approximately 4-5 minutes on high. Remove it from the microwave and allow it to cool for at least 4-5 minutes (trust me don't rush this step!). After the cauliflower is slightly cooled, place it in a kitchen towel and squeeze all the liquid out of it. Be sure to squeeze as much liquid as humanly possible. Bake the crust for approximately 10-15 minutes (depending on your oven), or until the crust is golden and crispy. I cooked mine for approximately 15 minutes. After the crust is golden remove it from the oven and top with pizza sauce then cheese then the chopped veggies. 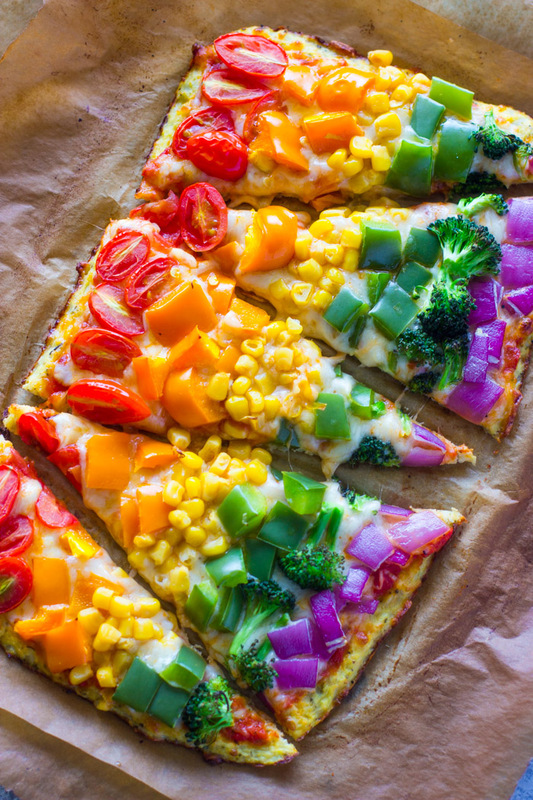 This rainbow cauliflower crust pizza looks absolutely fantastic. Beautiful photos, too. I look forward to trying this. This is absolutely magnificent, scrumptious, delicious, super yummy rainbow cauliflower crust pizza. Never seen something like this! Definitely i will try to make it too! Thx for sharing! Can you freeze for future use? Wow, I just love this amazing recipe!!!! So healthy and colorful at the same time. Have to try making it very soon. Made this for a pair of toddler boys today! The crust was fantastic and the boy ate some veggies! Thanks for sharing the great recipe. This looks wonderful – my rainbow-loving daughter will adore it! I see that you’ve set the oven for 500 degrees. I usually bake crusts (including my other recipes for cauliflower crust) at 400, then broil the toppings. Can I do that here? (500 degrees for over 30 minutes seems a bit energy inefficient, even consider a potentially longer baking time at a lower temp. Plus…summer in Georgia makes running the oven uncomfortable anyway!) Thanks! Wow! Just. Wow! I cannot wait to try this. Such a brilliant take on “eating the rainbow”! I’m going to share this with everyone I can! Thanks so much for stopping by Ami! I’m sure you will love it! hi cannot wait to try this recipe!! The recipe serves four and the nutritional facts are per serving/slice of pizza. I just happened to cut mine into 5 slices. I love that this is totally VEGGIE-packed! Also that it’s beautiful! What do you suggest for pizza sauce ? I absolutely love the idea, however I just learned that my 6 year old has high cholesterol so we should avoid egg and cheese. You already explained how to substitute egg, any idea if I can omit cheese or substitute with something else? As much as I would like to keep him on diet, I still want to make sure that his meals are tasty. I would appreciate any suggestions. I don’t have a microwave. Can I steam or boil the cauliflower? Yes, you can steam or boil it for 5 minutes before placing it in the food processor. If you are boiling it I suggest simply thinly dicing the cauliflower with a knife after boiling it instead of using the food processor because it can become too mushy. What can I substitute the egg for in this rainbow pizza recipe? My friend has a severe egg allergy but we would really like to try this. You can use a flaxseed “egg” by combining 1 tablespoon of ground flax seed with 3 tablespoons of water. Stir well, and place in the fridge to set for 15 minutes. After 15 minutes, the result should be a sticky egg-like substitute. It looks absolutely delicious! Thank you for including the nutritional values, most recipes and bloggers do not! !